I had mentioned a few weeks ago I wanted to start making some card videos. So, I have decided to start a series called "Watch Me Work." I'm not sure how often these will go up, but I would really like to aim for once a week if possible. I needed to make a Valentine's Day card for my husband, so I thought this would be the perfect card to start my video series with. I started out by die cutting a large heart in the top center of my card front panel using the Stitched Hearts Layers dies from Memory Box. Then I die cut the next size down from pink card stock, and attached it behind the card front. I stamped the hearts from the The Stamps of Life hearts2diefor set right onto my card front with My Favorite Things Cherry Crisp pigment ink. I can't find this one online anymore, I received it as a free gift from CKC Manchester a couple of years ago. I did note that My Favorite Things has Cherry Crisp in hybrid and dye inks on their website. I added clear Ranger embossing powder over the stamped image and heat embossed it with my Martha Stewart heat gun. 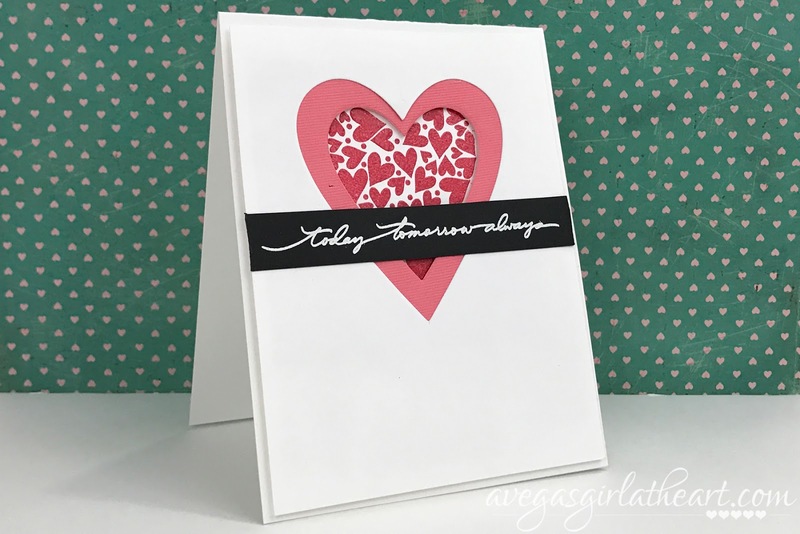 I then stamped the "today tomorrow always" sentiment from the Technique Tuesday True Love stamp set onto some black card stock with Versamark ink, and used Stampin' Up! white embossing powder to make it pop. I attached my card front with foam adhesive, then added the sentiment right on top across the window.